Did you know that classic cinemas theatre’s do dollar movies? Ever Wednesday morning they do their kids movies series from the start of summer, until right before school starts again. I did a little investigating after this and found that most movie theaters have an equivalent to this concept. Marcus theatre’s do a 5 dollar Tuesday to see any of the hottest blockbusters. If you become a magical movie rewards member then you get a free 46 ounce popcorn, and have the ability to only pay $2 for some candy or hot dogs. 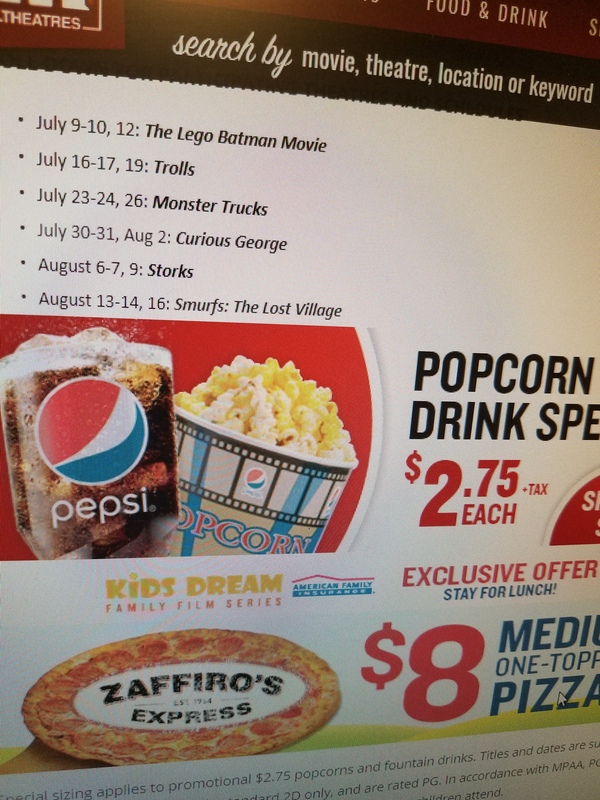 In addition to this they do a 3 dollar entrance for a replay on a family friendly movie as well. Every Sunday, Monday and Wednesday at 10am. The more I look the more I find that almost every theatre has there own version of this concept. What a brilliant way to bring people back into the theatre’s! It’s a wonderful way to teach children how to sit for a movie while being able to enjoy the settings of the theatre! Miracles can come in a container!